This week, the Mighty Nein traveled to Asarius, the City of Beasts, and learned a secret that shook their perception of the world and the heavens. They also began to investigate Xhorhas, and found the seed of demonic corruption growing beneath the city. What other horrors could lurk within this strange land? Previously on Critical Role, the Mighty Nein traveled across the wastes of Xhorhas to Asarius, the City of Beasts. Along the way, they encountered many of the mighty dangers of the wastes, from Kryn battlemages and rampaging gnolls, to plague-ridden rocs and terrified bugbears. This week, the Mighty Nein reached the City of Beasts itself, guided by Gluzo, the bugbear that survived the roc’s attack. On the journey, Gluzo told them about the Luxon—the original god of Exandria, and supposedly the source of all life in the world. Somehow, this unknown and ancient deity of light and creation was related to the dodecahedral beacon the Nein had taken from the Kryn assassin back in Zadash. On the outskirts of the city, the more human-like members of the party used magic to take on more monstrous appearances to disguise themselves. 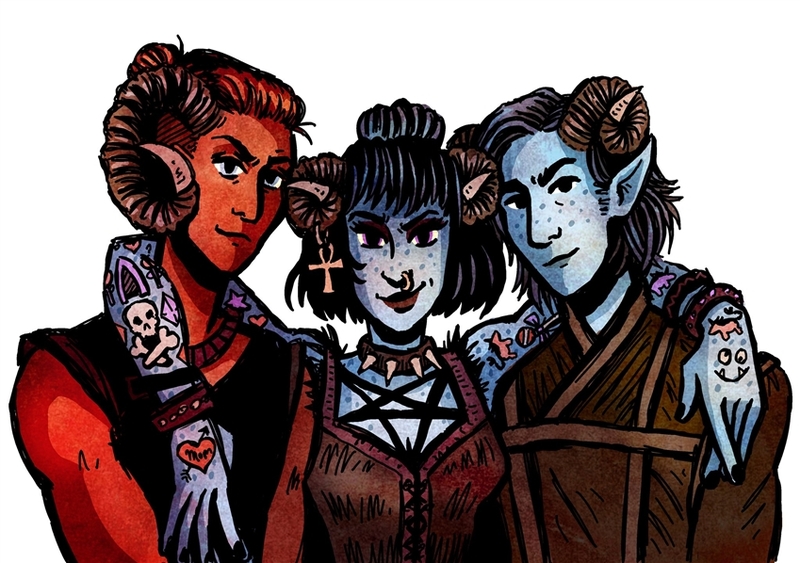 Jester used magic to make herself look like a goth version of herself, Caleb transformed into Jester’s twin, and disguised Beau as a male tiefling. Fjord made himself look like a wall of muscle, more like a full-blooded orc than his usual form. Yasha, familiar with this land, applied some war paint to make herself look even more formidable. Asarius was bustling with life, and was filled with goblinkin, kobolds, and even a hulking minotaur—which both Travis (in real life) and Nott (in game) were utterly smitten with. Several amazing beasts of burden and war lumbered around the city’s perimeter. Giant tortoises carried instruments of war. Beasts that looked like oversized, tailless panthers—which the party later learned were called moor bounders—bore riders. And lastly, war beasts the size of a building, with bodies like elephants and faces like spiders patrolled the city’s edge, with Kryn warriors mounted atop them. Aurochs, giant primeval oxen, were used as beasts of burden, as well. The party allowed themselves a brief distraction by speaking with the mighty, black-furred minotaur. He introduced himself as Sunbreaker Ulaman—and described himself as being close to “Umavi Ascension,” whatever that meant. He suggested that if they were mercenaries looking for work (and Beau noted their rapidly thinning wallets), they could go to the Aurora Hold and meet with Lady Zephrys Olios, the dark elf governor of this city. Nott wanted to linger with the minotaur, but he had other business. Moreover, Caleb was adamant on finding mounts that would speedily carry them to Ghor Dranas, and he hastened their pace towards a stable. They met with Zolth, an elderly goblin shopkeeper with a ridiculous voice and haggled for a trio of moor bounders. Zolth eventually agreed to a massively discounted price, but demanded that they investigate the shop’s cellar and exterminate the creatures lurking down below, in exchange. Down beneath Asarius, the Mighty Nein encountered a trio of horrific, demonic creatures: shoosuvas! The battle was fierce, but the party dealt with the bestial demons and even managed to shutter a tiny rift into the Abyss itself. The presence of an extraplanar portal troubled everyone in the party, and they decided to visit the Aurora Hold and speak to Lady Zephrys while they waited for Zolth to prepare their mounts. Jester and Nott, under the pseudonyms of Jango and Nash, were granted an audience. They discussed the demons, and Lady Zephrys offered them several lucrative contracts. Notably, she asked them to root out an imperial spy that might be lurking in the city, offering 3,000 gp for him dead, or 5,000 for him alive. Further, she noted that people have been reporting poor sleep and possible demonic corruption throughout the city, and asked the duo to seek out any active Abyssal portals within the city, offering 10,000 gp if they could completely eliminate the threat. The party decided it would be best for them to try and tackle some of these quests and replenish their dwindling supplies before traveling on to Ghor Dranas. My partner Hannah (@wildrosemage) and I have an ongoing joke when watching Critical Role: if I can’t identify a monster Matt has introduced within the first five seconds of his description, then he’s made it up himself. This was the case for the beasts lurking outside Asarius, but I was surprised to learn that it wasn’t true for the monsters the Mighty Nein confronted beneath the city. The spiny, stinger-tailed beasts the Nein battled were shoosuvas, lesser-known demons from Volo’s Guide to Monsters. The introduction of these creatures in isolation is somewhat unnerving, if you read their lore. These beasts are monsters created by the demon lord Yeenoghu himself, and granted as gifts to his most trusted gnolls. The Mighty Nein battled a few gnolls last episode, but so far there’s been no indication that demon lords have been directly involved with the state of Xhorhas. Shoosuvas are powerful but fairly straightforward creatures. They don’t possess any special movement options, and their attacks are rather standard, save for the tail that can deliver not only massive damage, but also deliver a paralytic poison. This poison is mechanically interesting because, against this monster at least, immunity to poison grants the character the much more powerful immunity to paralysis. Consider taking this “rider effect” approach to monster design if you want to make a monster slightly stronger, but not too much stronger, or if you want to nerf a monster effect that’s just a bit too powerful. The abilities of the shoosuva also present a clever way to integrate your lore and mechanics to make a more holistically interesting monster. 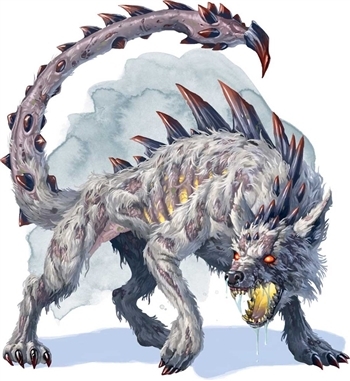 These creatures are servants of Yeenoghu, and are granted to powerful gnolls as guardians. But the shoosuva’s main power is its paralytic poison, a trait that gnolls don’t typically have. How do you thematically unify these two creatures? In this case, it was by granting the shoosuva demon the gnoll’s characteristic Rampage trait. That trait saw some action in this episode—even though there was a rules misunderstanding involving it—when the demon was able to take an extra attack when it knocked Yasha out. Just like a gnoll, this demon can take extra movement and make an extra bite attack as a bonus action, thanks to the bloodlust inspired in it by Yeenoghu himself. You can apply this trait to any creatures you want to form a close thematic link between. Do orcs ride worgs in your setting? Grant their mounts the Aggressive trait iconic to orcs! Do hobgoblins keep imps as pets? Perhaps their dark god Maglubiyet has granted those imps the power of Martial Advantage that hobgoblins are so feared for. What creatures would you modify in this way? 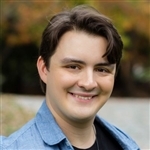 What lessons can we learn from Matthew Mercer and the Mighty Nein next week? Is it Thursday yet? Good stuff, man. I have always believed that any role-play/lore element in a game should be backed up by some kind of mechanical evidence. This isn't always possible, but 5e is so good because it gives enough room for DMs to get close enough to the mark that their players are amazed. Keep up the good work, man. Ah, I see you are a person of culture as well. I also play the "name Matt Mercer's monster-of-the-week" game, though I allot myself the time it takes for someone in the chat to name it successfully first. Unfortunately I lost this game with the shoosuva.